There’s a cool colour combo over at the Color Throwdown this week – coral, red, green and grey. Not necessarily the most traditional festive combo, but I knew I wanted to create a festive card with them, so I pulled out an older Woodware stamp and got to work. I used a light grey card base to stamp the image in green ink; I added some clear embossing powder on top to give the image a little more ‘body’. Then I coloured each dot using my prismacolor pencils before I added some Nuvo Jewel drops on top. To finish off the card I added a sentiment from the Simon Says Stamp/Gina K Stamptember collaboration set. I’m back with another guest post for CAS Colours & Sketches challenge. This week, the team has come up with a great sketch which is perfect for CAS cards. I’ve recently reorganised my craft room a bit and came across my old punches which I still can’t bear to part with. So I was delighted when I saw this sketch as it gave me the perfect opportunity to use them again! I cut the circles from some old rainbow backgrounds that I created with distress inks and adhered them to my base card. 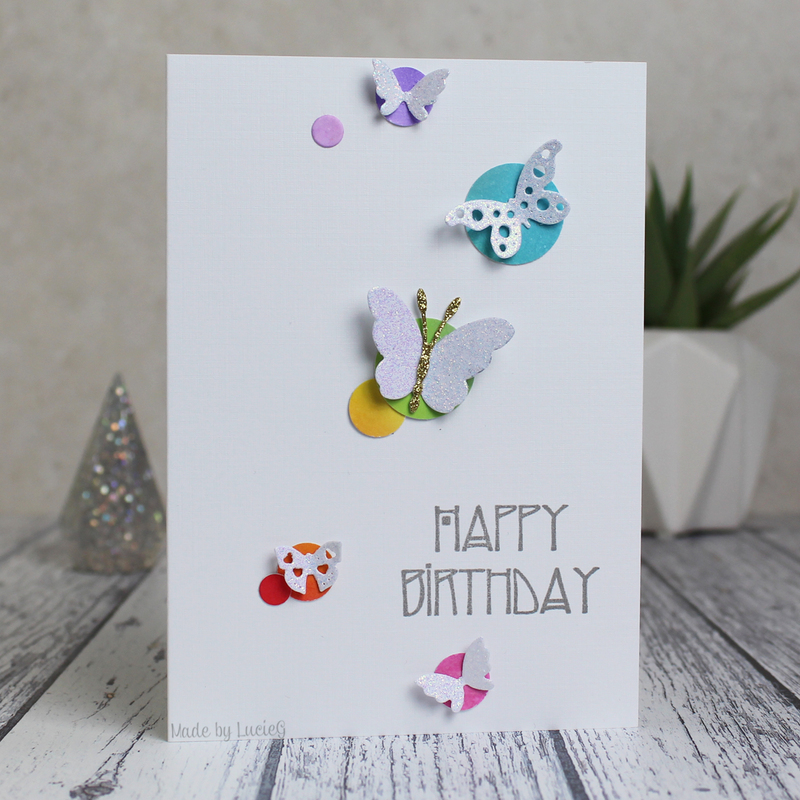 I then cut a selection of butterflies (from Penny Black, Poppystamps and Simon Says Stamp) from some glitter card and stuck them to the larger circles. To finish off the card, I added a sentiment from Woodware.